Last week I went to a couple of sessions of an art symposium. The invited guest speaker was the artist Brian Kershisnik, a local artist whom I find to be quite talented. During his speech, Kershisnik mentioned that he finds it important for painting to be self-aware. In other words, the painting should manifest awareness that it is a painting, awareness that it is a flat canvas which contains representations of objects with the medium of paint. This self-awareness of painting can especially be observed in Kershisnik's style, since his figures are very flat. 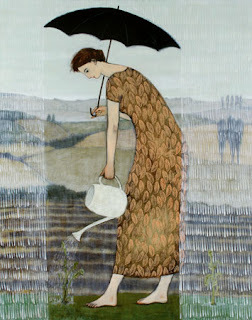 In this painting, Gardening in the Rain, the flatness of the figure (and subsequently, the flatness of the canvas) is further emphasized by the pattern on the woman's dress and the stylized depiction of falling rain. I am interested in one having a primary experience with painting and not a surrogate experience. In other words, Kershisnik aims to have a viewer of his work aware that he/she is standing in front of a canvas that is covered with paint. In my opinion, this aim is in contrast to many realist painters who hope that the viewer is able to place himself/herself within the painting and have a surrogate experience with the work of art ("I feel like I'm actually there!" kind of idea). With a primary experience, however, I think that one is completely external to the painting and aware of his/her present surroundings. I think that this escapist/surrogate experience has its own place within the world of art, but I think that I generally prefer the primary experience. I love looking at the tactility of the paint (hooray for impasto!) and observing the artist's "hand" through the movement of the brushstrokes. What do you prefer? A primary experience? A surrogate experience? A mixture of the two? In some ways, I like having a mixture of the two paradigms (I love to be swept away in the drama of Baroque subject matter), but I think I lean a little bit more heavily on the primary experience over the surrogate. Please join the discussion over there! Follow Alberti's Window on Twitter.